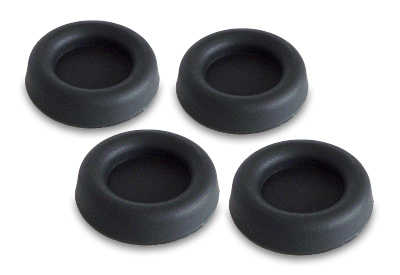 Four silicone anti-vibration PC case feet designed to absorb vibrations from PC cases and similar vibrating enclosures. A simple and economic solution to combat unwanted vibrational noise! 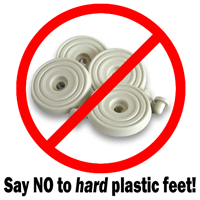 - throw away your plastic feet and apply a set of four self-adhesive soft silicone case feet! A great deal of PC case feet are solid plastic, or (at best) very hard rubber and therefore do a good job of transmitting unwanted vibrations from inside a PC via the chassis/case into the desk, floor or shelf on which the system sits. In this situation, where the case is in direct contact with the substrate, the PC can generate annoying noise elsewhere (secondary noise). Acousti Products have designed a unique pack of four self-adhesive silicone feet available in different softnesses (to support different weights). These feet are designed to decouple a PC case from the floor or other hard resting surface by absorbing vibrational energy, and therefore helping to minimise noise generation caused by vibrations. A little extreme? Well, yes, perhaps: but even with very quiet PCs it is vibration that becomes the most significant culprit/contributor to noise generation. So these case feet have been developed to try and minimise vibrations in the pursuit of 'ultimate noise reduction'. We hope you enjoy the difference! Image showing a plan and section of the silicone case foot (ACF3007). The foot design has a rounded edge (that is, the load edge), which helps to absorb vibration in both horizontal and vertical planes. Anti-vibration case feet are not just limited to combating PC noise and for vibration control in their application - they may be useful for Inkjet and Laser Printers, HiFi Separates, TVs, Small Form Factor PCs, Home Theatre PCs, and any number of appliances and enclosures that would benefit from vibration adsorption and reduction. Speaker cabinets may also be a useful application for these feet - helping to isolate the speaker cabinet from the surface on which it sits. These feet are low-profile (7mm high), so they won't necessarily be seen, and they are non-marking. The rounded edge is designed specifically to dampen vibration transmission in multiple planes. 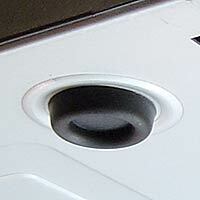 Image showing an AcoustiFoot on the underside of a computer case. *The optimal load is the heaviest weight at which compression still occurs in the feet. The feet can carry higher loads, but they become over-compressed and suffer a reduced vibration-absorbing capacity if overloaded. I used these to replace the standard rubber pads under an HP N36L Microserver. Before fitting the vibration from the drives in the microserver could be heard through the floor. I pulled the old pads off and replaced them with a set of the soft AcoustiFeet and the vibration is now suppressed so you can't hear the machine from the floor below. Much improved. Can't quite believe the difference these have made. I have 2 PCs on top of a wooden cupboard - makes a nice soundboard! Before these, you could hear the humming throughout the house. Now all vibration gone! Only pain is that as you get rid of one source of noise, another becomes apparent! My silent case fans don't seem quite so silent now. Also thinking about HDD silencers. Pound for pound, these are by far the best investment for reducing PC noise. The only situation they may not make a difference on is if your PC sits directly onto carpet but if not, then these little guys will make a huge difference to your PC noise levels. Of course these would only benefit you if your machine suffers from the dreaded HUM - HUM - HUM. This used to transmit itself through my desk into the whole room, replace the rock hard feet on your case and the vibration should go. I opted for these 'Soft up to 14kg', my case isn't exactly lightweight, with a decent power supply, 2 HD's 2 Optical drives and a big CPU fan. Even if the end total is nearly a fiver they are well worth it. They stick to metal well and are well worth it. When using them on non metal surfaces though, they don't stick well. I couldn't remove the feet on one PC case so stuck them to existing rubber feet. They stay in place because of the weight of the pc but when you wish to move the case for access to it, the feet can come off. I actually can't believe it! lost much. 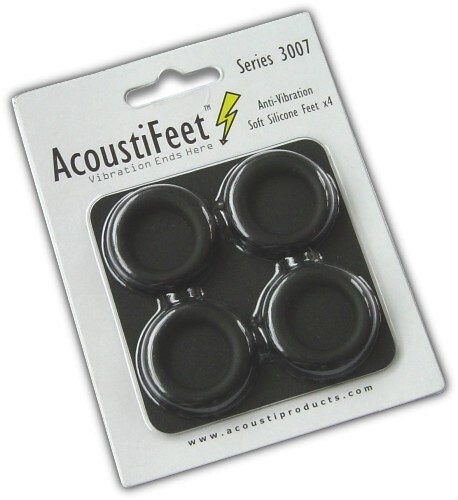 These AcoustiFeet are amazing! Not only did they arrive promptly they were simplicity itself to fit and the vibration from the box has completely disappeared. Thank You! I own an Antec 1200 gaming case which is pretty loaded with gear, and very heavy so got these firm feet which as I said before, worked perfectly!!!!! These feet are HIGHLY recommended by me. I'd give 10 out of 10 for performance, 10 out of 10 for QuietPc's price and speed of delivery. Thanks very much for your swift despatch. I have a 37" LG TV which has an "invisible speaker" system. The cabinet of the TV is supposed to increase the sweet spot. Many though have reported across various forums that their speakers vibrate on certain tones, certainly enough to be a pain, (a claim conveniently denied by LG). I didn't want to go opening the back, fitting padding etc. and all that malarkey and otherwise it's a great set so I stumbled upon the Acoustifeet via a post on AVForums. where before I had tweaked settings that lacked the oomph! that's provided by the Cinema mode. Thanks very much!